After a slow start to the day of brakes being repaired and Nancy visiting Urgent Care we finally hit the road to Murfeesboro, AK on February 16, 2017. 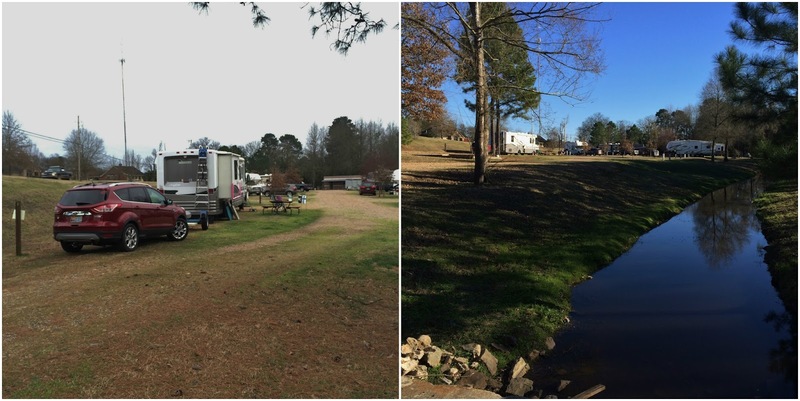 Murfreesboro RV Park is just east of town. This was actually a second choice of parks and we are so glad we choose this one. It is very well maintained, owned by the local sheriff! Clean and very quiet. We had the only pull through site which was long enough for our rig, tow-dolly and parking the car. The WiFi was good and Verizon signal was fair. Laundry and bathrooms were clean. We paid $27.35 a night with our Good Sam discount. There is a creek that runs through the park and a wooded area that was perfect for letting Mielikki off lead. We were just minutes from the diamond mines and the RV park offers instructions on how to mine plus equipment to use. 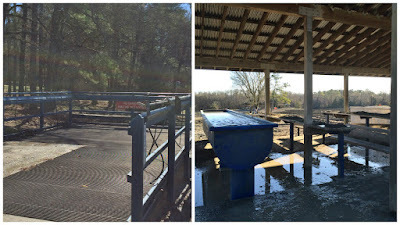 They also have a washing station to clean any dirt you bring back from the mines. Craters of Diamonds State Park is was brought us to this area. 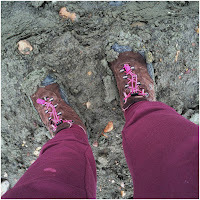 Unfortunately we couldn't get to the diamond mines for a few days due to rain and our first day there was hampered a bit because of the mud. About 100 million years ago a volcano erupted where the park sits today. When the volcano erupted the diamonds were thrown out, then sucked back in and erupted again later. This gives the Arkansas diamond a unique facet that can't be found any where else in the world. 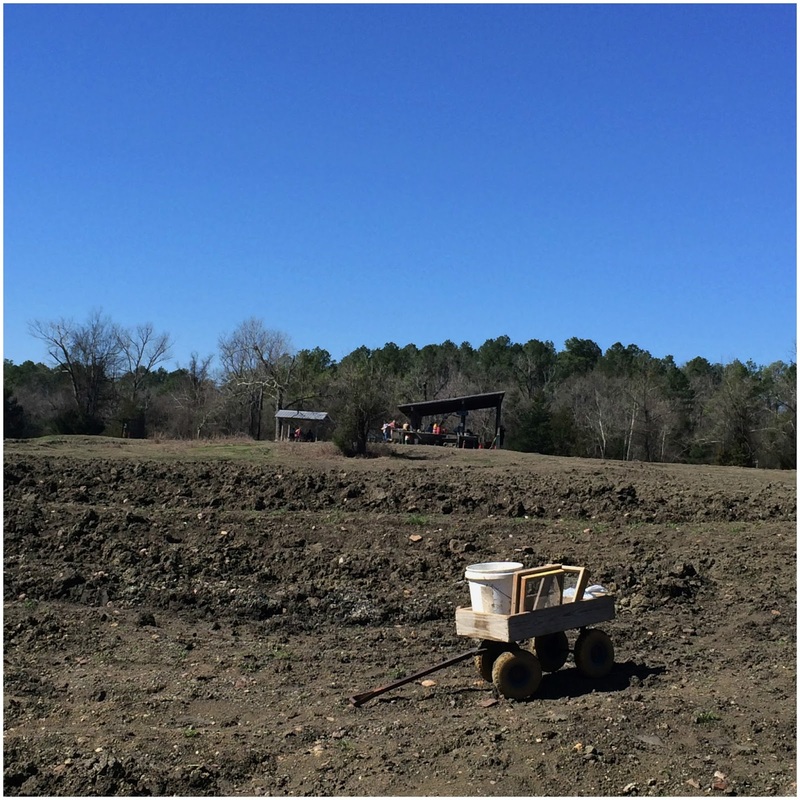 The first diamonds found here were in August 1906 by John Wesley Huddleston. Earlier that year he had purchased the 160-acre parcel of land to build his family home. That decision changed his life forever. Before the property became a state park in 1973 it was a private commercial mine. 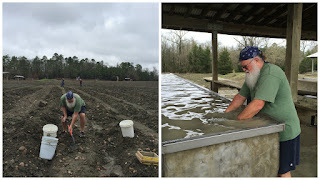 The park fields are plowed to bring up new dirt and hopefully diamonds.There are two washing stations that have large tubs of water to clean the dirt and tables to sort through it all. Plus, a large grated deck for rinsing off your buckets, wagon, shoes etc. The park rents all of the equipment needed and at reasonable prices. There are also metal cages that you can rent to store your equipment so you don't have to carry it in and out every day as there are a number of people who work at this like a full time job. Two guys that were there on our second day had dug a trench that was over 6-feet deep. At last count they had filled 18 buckets. 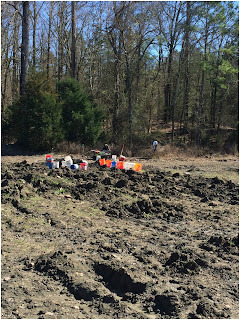 While we did not have any luck in finding a diamond a number of them have been found over the years. Our second day out we rented a wagon, a very wise decision. 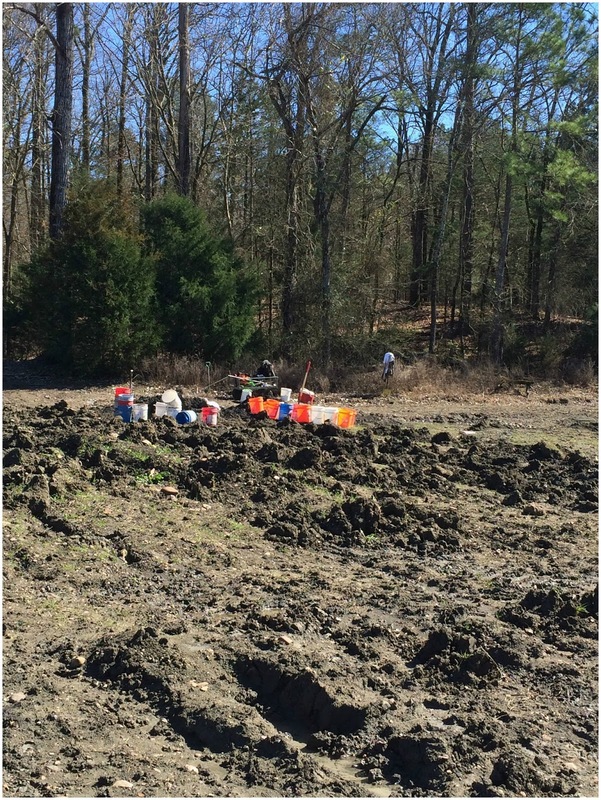 A 5-gallon paint bucket filled with wet dirt and clay is very heavy to carry across the fields to the washing stations. It was a fun experience, a lot of work but we are glad we did it. Not everyone can say they have been diamond mining. 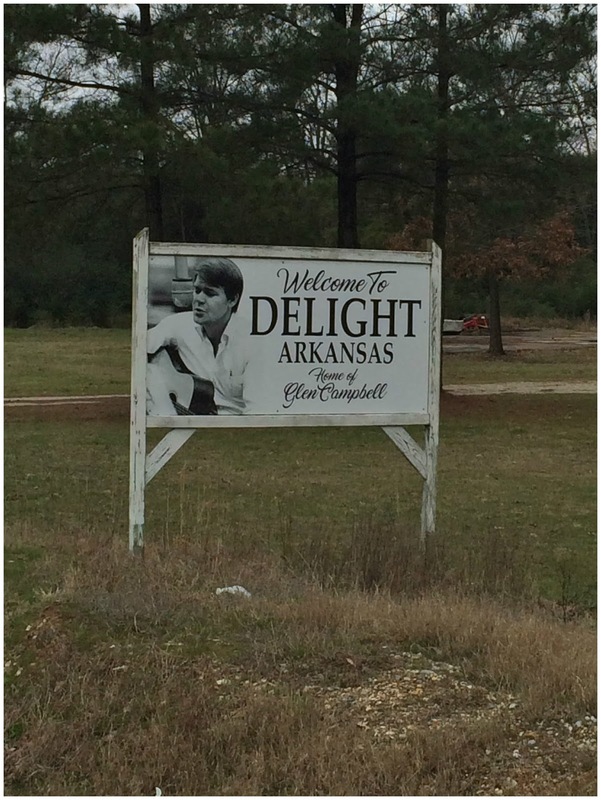 Hope, AR is the birthplace of President Bill Clinton. We visited his Presidential Library and Museum in August 2016 when we stayed in Little Rock. 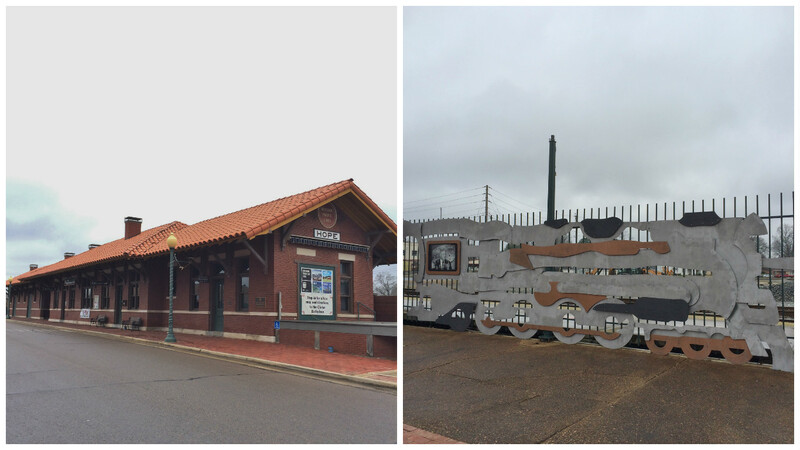 Our first stop in Hope was at the old railroad depot, which is now the Visitor Center and Hope Museum. A delightful lady greeted us as we entered and shared a great deal of history. 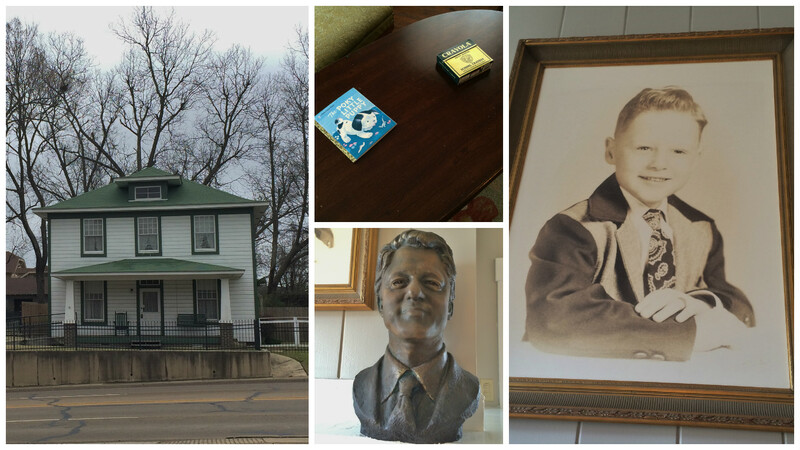 From there we visited President Clinton's boyhood home. 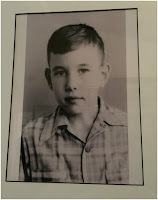 It was his grandparents home, they took care of him while his mother was in nursing school. There is not much left of the original furniture but the period pieces take you back to that time. Nancy loved that the table had the Pokey Little Puppy book and Crayola Crayons - her two favorite things. We have visited a number of Presidential Libraries and homes and it is always interesting to see where they came from and what helped to shape the men they became. 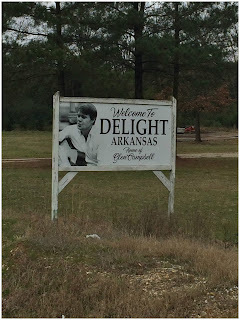 Of course we took the long way home and drove through Delight which we discovered was the home town of Glen Campbell. 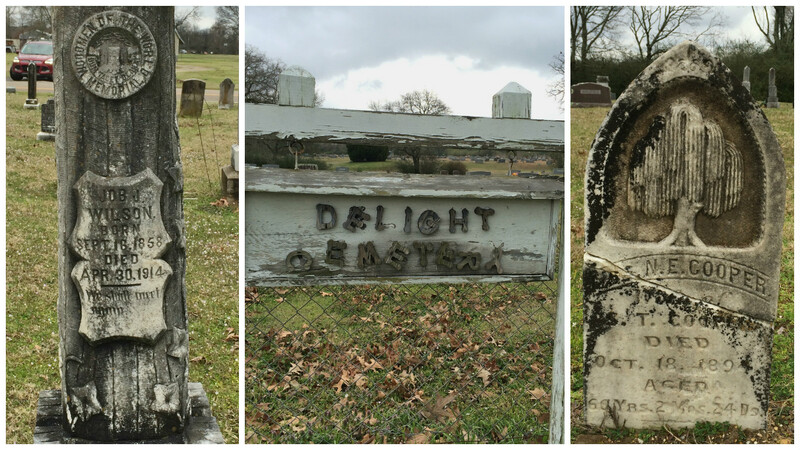 We stumbled upon the Delight Cemetery and as you know we love to explore old cemeteries. We found a wonderful Willow Tree, this is one of the oldest symbols used on grave markers and it is hard to find one in such good shape. The headstones are in better shape than the sign. 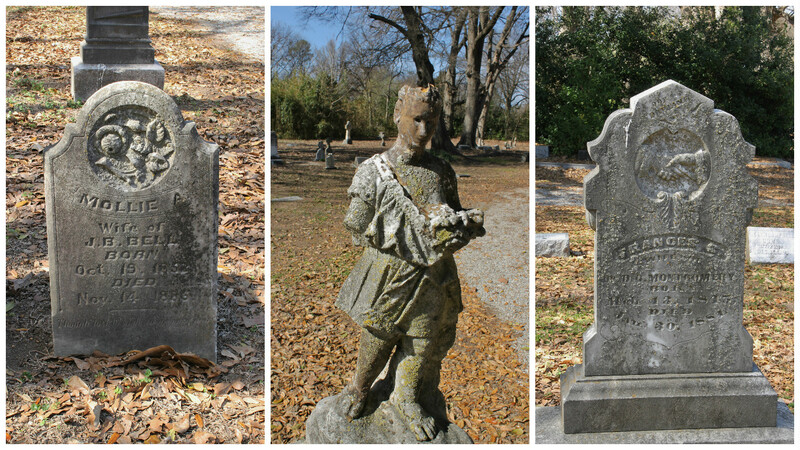 We have been finding more Woodmen of the World memorial headstones. This one was for Job J. Wilson, 1858 to 1914. On one of the rainy days we headed off to Hot Springs, we visited here as well while staying in Little Rock (link to that blog in the Hope section). It is a cute little town, touristy but still has some charm to it. It is where President Clinton attended high school. On the way we found a new roadside just outside of Bonnerdale. A fire engine is planted as a memorial to Irvin C. Bainum, he was the founder of the Bonnerdale Fire Department. 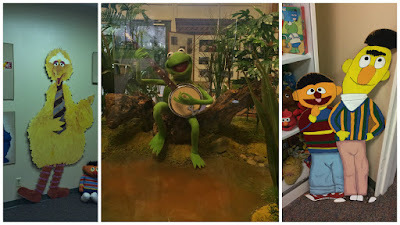 We visited a few stores that we missed the first time and some that are new to the town. The trees were in bloom and we found a great ghost sign. Lunch at the Superior Bathhouse Brewery and Distillery was delicious, it is located in one of the old bathhouse building. In 1818 Murfreesboro was named the capitol of Tennessee, due to its central location and held that until 1826 when Nashville became the capitol. Diamond mining is now what it is famous for but it does honor its Native American heritage as well. but we did find get books in their gift shop that will help us find more mines as we travel across the country. They also have the World's Largest Diamond. The morning we left we had to have the propane tank filled, while waiting Nancy and Mielikki went exploring and found the stairway to nowhere. 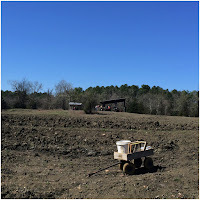 On February 24, 2016 we headed to Lake Village, AR which is on the border of Arkansas and Mississippi. We stayed at the Pecan Grove RV Park and as the name suggests it is full of pecan trees. In fact you can buy bags of pecans at the office. The park is right on Hwy 65 so there was some road noise but at night it wasn't bad. The site was plenty long enough for our RV and tow-dolly and a little above average width. There are large open fields for walking the dog. The laundry room is rather small and a little musty. WiFi was fair and our Verizon signal was strong. We paid $32.17 with our Good Sam discount. Our first night in town we couldn't resist our craving for pizza any longer and with a name like Fox we knew we couldn't go wrong. We were also treated to a beautiful sunset that night. Roadside Oddities can be fun to find and photograph but sometimes the directions are not the best. That was the case with the Giant Tire Man in Dumas which is north of Lake Village. In the process of searching for it we saw all of Dumas and then some. Trying to take back roads home proved to be just as difficult as we ended up on the levee road and some very interesting gravel roads. Let's just say we thought we were driving through someones farm field. 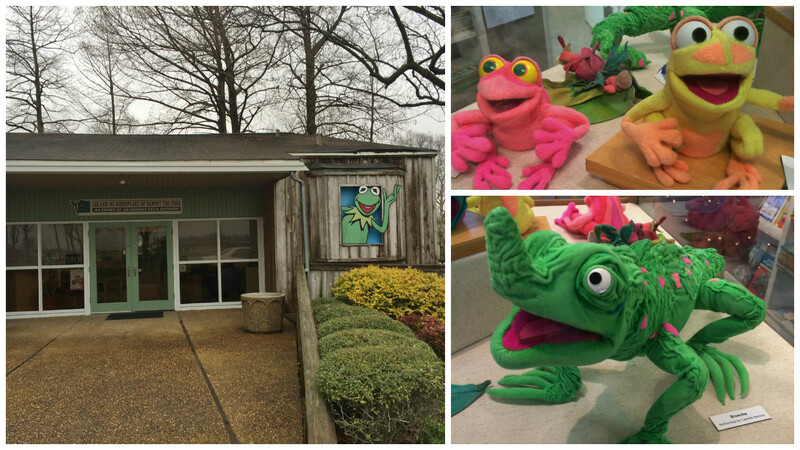 As mentioned Lake Village is on the border of Arkansas and Mississippi. We spent more time in Mississippi than we did Arkansas. Lake Village is one of the few places you can cross the Mississippi River. While Greenville is just across the Mississippi River the Riverboat Visitor Center is no where near the water. It is an old riverboat with the visitor center on the first floor and a small museum on the second floor. 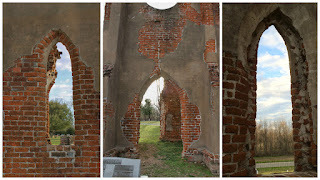 The Cypress Preserve Trust is right on Hwy 82 and as you drive past it you don't realize what treasures it holds for you. It was created in 2001 by the Greenville Garden Club to not only preserve the trees but to educate people of the importance of nature and their surroundings. They bought the property in 1940 as urban development threatened to destroy it. 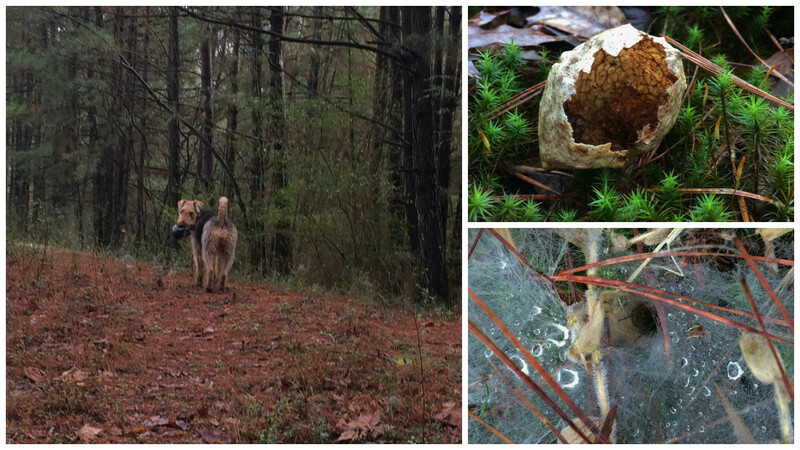 The 16 acre park has woods, sloughs (pronounced slews) and a meadow that are criss-crossed by three different trails. You can walk as far or as little as you want. 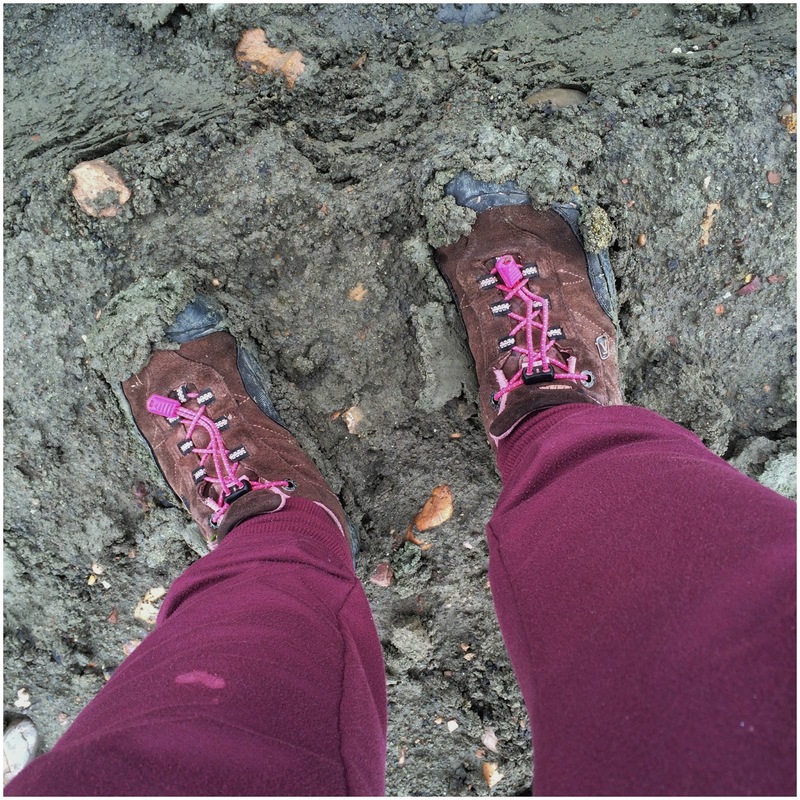 The trails are both gravel and asphalt but very level which makes them handicap accessible. Along each path are information boards describing the local flora and fauna. While we were there we saw a number of people who use it for their exercise walk, what a wonderfully peaceful place to get healthy. 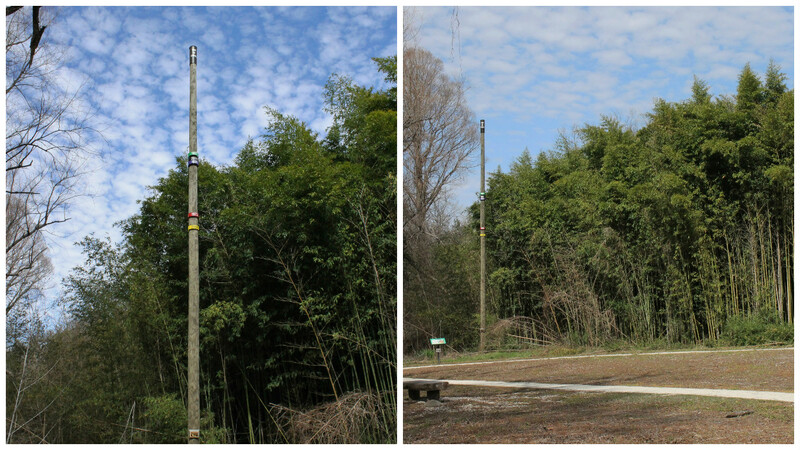 The park has three sloughs; a wetland or swamp where cypress trees grow. They are also referred to as brakes. Finding them in an urban setting is very unique. It is also home to a number of wild flowers, critters and birds. The sloughs are filled with duckweed, it "floats" on top of the water and is not only a source of high protein food for water animals it provides shelter for bullfrogs, snakes and fish. It produces 10-times the protein per acre as soybeans and is a staple in the diet of people in Southeast Asia. Not only can help stop water evaporation but Japanese secret spies used to swim under blankets of it to conceal their movements. A multi purpose plant. The cypress "knees" or what Nancy calls water trolls provide stability and the anchor the tree in soft mud. In 1927 the most destructive flood in the history of the US happened here. The Mississippi River broke through the levee on April 21, 1927 and a section 50 miles wide and 100 miles long was flooded with waters reaching up to 30-feet deep in some areas. 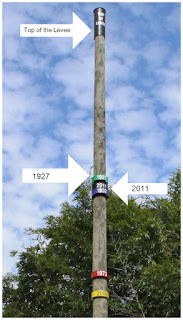 They have a pole that marks the different floods that have happened over the years. The top of the pole is covered in black and shows the top of the current levee which has stopped the river from flooding the city. The bottom yellow mark is from 2008 when the water rose 14.5 feet above the GPS marker at the preserve. In the center is the 1927 flood at 21.2 feet and the 2011 flood at 21.02 feet. It is hard to imagine that much water. 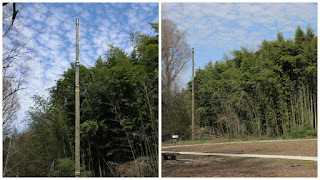 Behind the pole is a large bamboo forest, which is a non-indigenous plant. Almost 20% of the plant species in Mississippi are not native to the state. These three benches along with others in the park were made from an 85-year old bald cypress that fell here during a storm in 2009. Les was reading the story of them while resting there. Once again we found ourselves at another old cemetery. This time we were at the Greenville Cemetery which is home to "The Patriot". 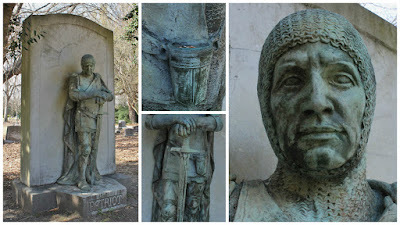 He stands over the grave of Leroy Percy, a Democratic Senator from 1910 -1913. We found a number of other well preserved symbols. 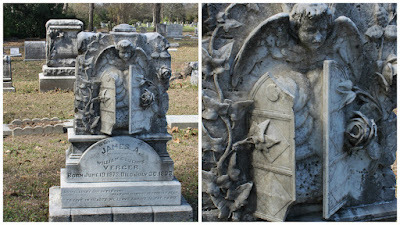 Flowers are a symbol of Christ and shortness of life, the clasped hands are for farewell and devotion of the departed. We first found out about the meaning of the symbols at the Nashville City Cemetery when we visited there from our stay in Eddyville, KY in May of 2016. Some are quite elaborate and we aren't sure what they mean. Angels of course are very popular but we are not sure what is behind the doors - guessing the gateway to Heaven. 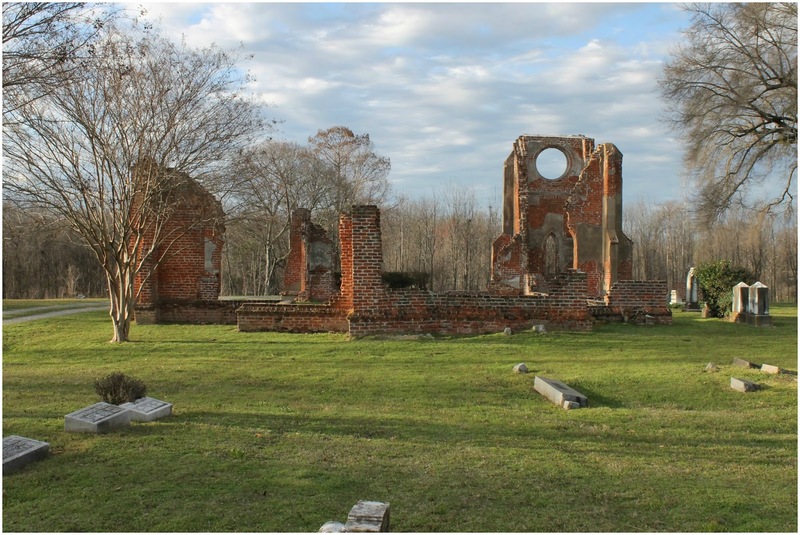 From there we drove south about 30 miles to Glen Allen to visit another cemetery but this time it was for ruins not headstones. 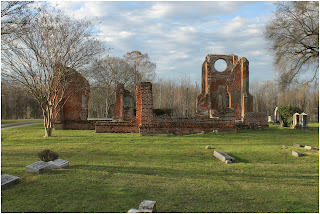 The ruins of St. John's Church sit in the Greenfield Cemetery. Construction of the church was finished in 1856. 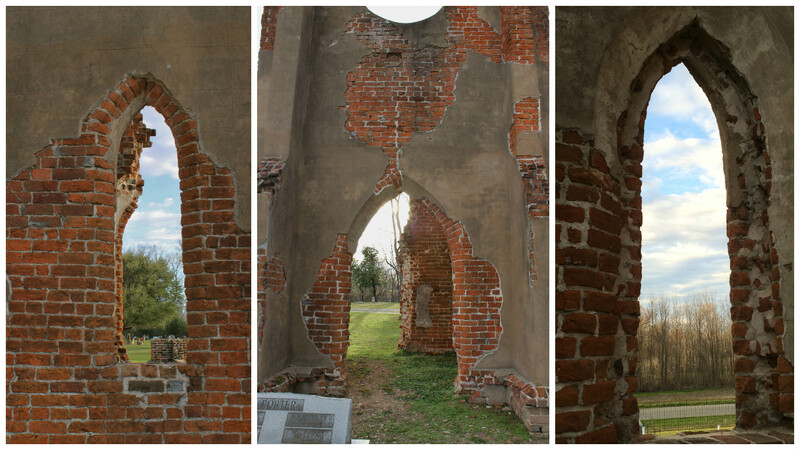 The building was ransacked during the civil war and the window lead was used for bullets. The remaining structure was wrecked by a tornado in 1904. 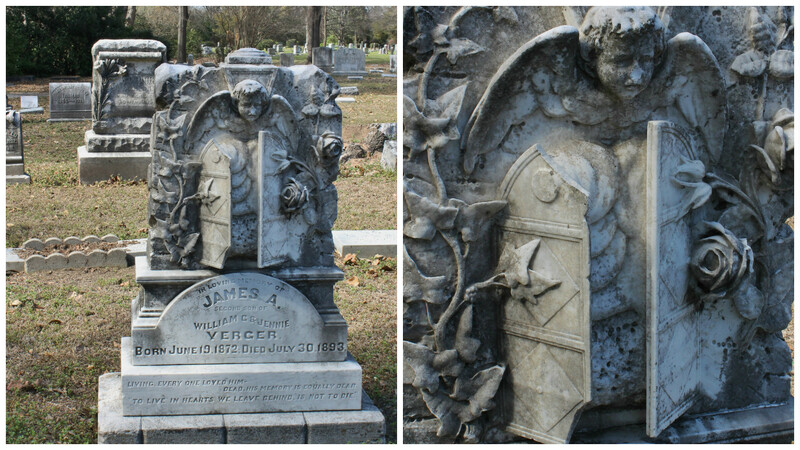 Jesse Crowell directed the construction of the church and hand carved the wood for the pulpit and railings. He was born into slavery and after the war and gaining his freedom he became the sexton of the church and was the first person of color to be buried here. The Winterville Indian Mounds are a part of the Mississippi Mound Trail and they are the largest Native American mound site in the U.S. 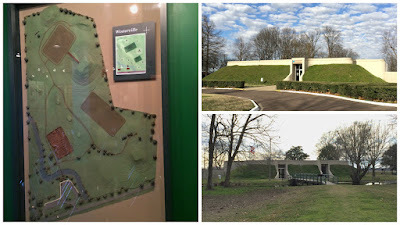 The Mound Trail runs 350 miles along Highway 61 as it parallels the Mississippi River, thrity-three sites have been recorded, many on personal property. Susie Smith, the Administrative Assistant of the Winterville Mounds, was a treat to listen to, she shares so much excitement along with her knowledge. Due to reconstruction from storm damage we couldn't get into the entire park, but it was very interesting non the less. The museum is built partially under ground and is filled with photos from the excavation of the mounds and artifacts that have been found. Susie shared a story with us about the wooden canoe. 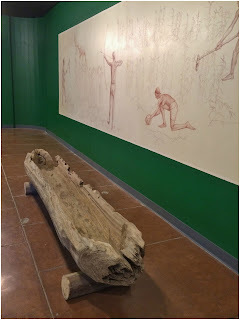 When she was young this canoe was found in her front yard during road construction. 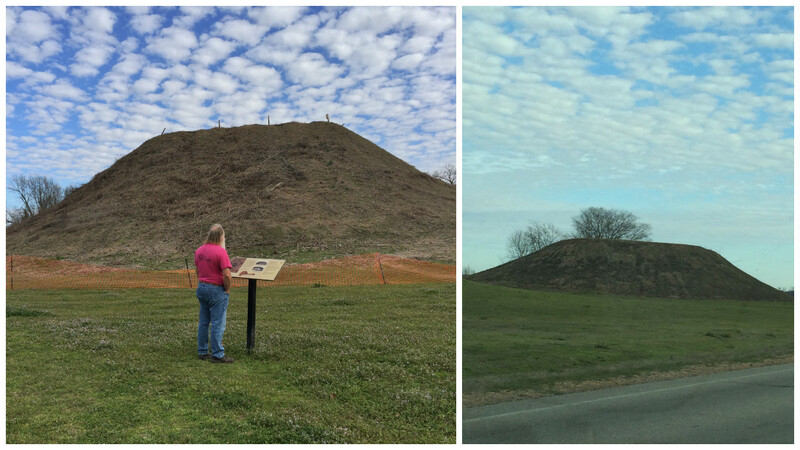 She never knew what happened to it until she came to the Mounds. The original site extended far beyond the 42-acres that are now preserved. It is believed that 23-mounds once encompassed this village. Only 11 mounds and two large plazas remain today, the remainder were destroyed by development of the area. Temples and homes of the highest ranking members were built atop the mounds. A cluster of homes surrounded the plazas and thought to be inhabited by tribal members who supported and protected those on the plaza. The rest of the society lived on farmsteads in the surrounding area and only came to Winterville for ceremonial occasions. Highway 61 is not only the Mounds Trail but also The Blues Trail. 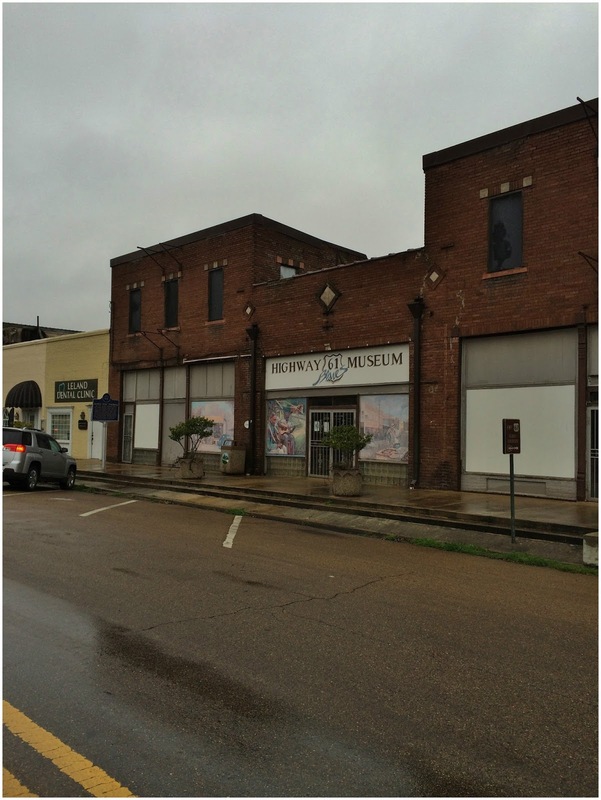 The Mississippi Delta is the birth place of the Delta Blues and the area is rich in music. The trail runs from Memphis, TN to Vickburgs, MS. Nelson Street in Greenville was once a lively music scene but today nothing is left except boarded up buildings. If you travel east about 8-miles to Leland you will find the Hwy 61 Blues Museum, unfortunately it was closed when we got there, even though their website said otherwise. While Nancy was taking pictures a lady pulled up and got out of her car to ask if we were there to tour the museum. When she found out we were from out of town she pulled out her phone and started calling the owners. One didn't answer and the other was out of town so we still didn't get in but you gotta love the friendliness of a small town! 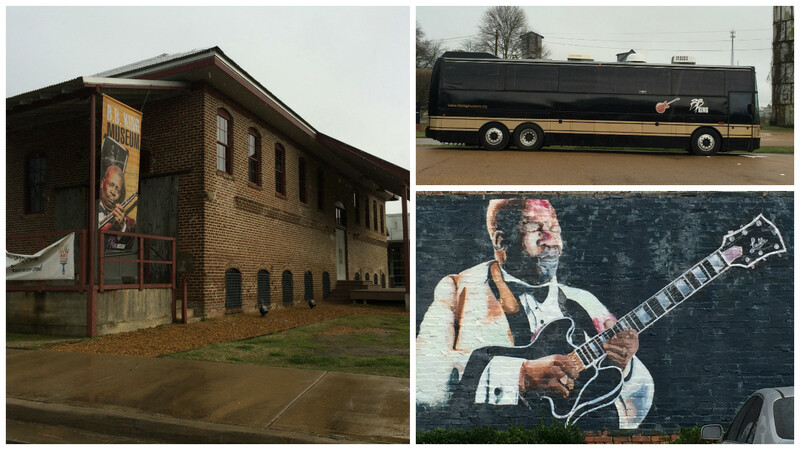 There are also murals in Leland to honor the Blues Trail. 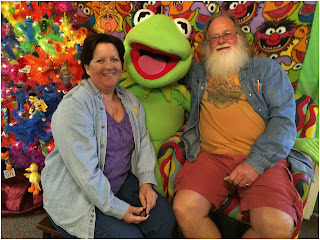 Leland is not only home to the Blues but also Jim Henson of Muppet's fame. There is a small Jim Henson museum that is chock full of memorabilia. 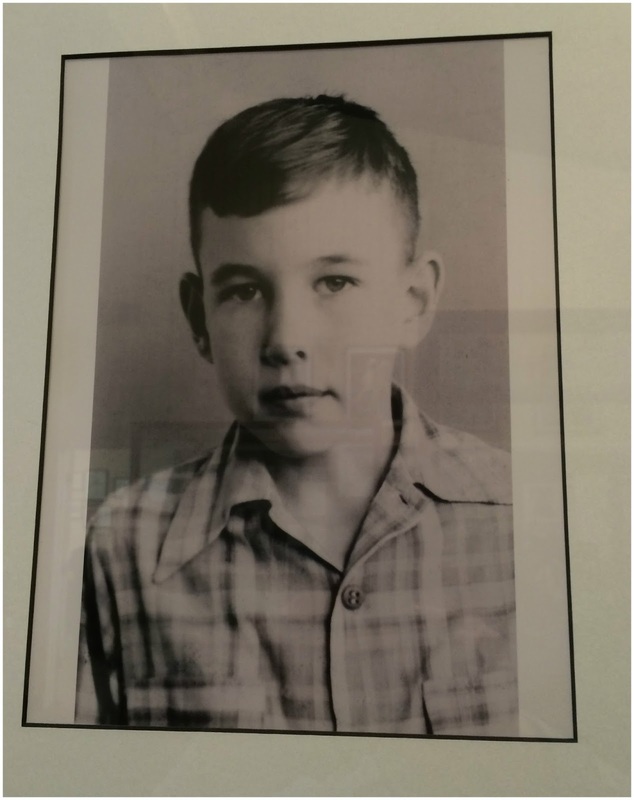 He lived here as a young boy before his family moved to Maryland. The lady that works there has so much passion for Jim it was contagious. Not that Nancy needed any help and she was pretty excited to get a picture with Kermit. B.B. 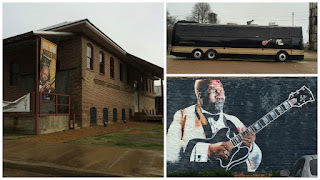 King, the king of the blues trail has a museum in Indianola, about 20 minutes east of LeLand. We had the dog with us so didn't venture in but snapped a few pictures and some of the murals in town. While we are not on a specific time frame we do have to plan to be back in Asheville, NC at the end of each March to renew our license plates. We also get all of our doctor appointments in as well. So we have to plan accordingly. What that means is that we don't always have time to extend a visit so we pack as much into the week we have. While this is great on one hand - it can be exhausting on the other. Especially if you are like Nancy and need a re-charge day. We always plan a day off at each stop but that day is usually filled with all the fun stuff like laundry and cleaning, not much re-charging in those activities! After two years on the road it is even more important to find down time to just sit and relax, or hike somewhere without a purpose or for Nancy pull out her sketch book and do some doodling. This is just as important for those not on the road, we pack our lives with so many things to do that we forget to take a break and take care of ourselves. So this week find a little me time to enjoy.